This article is part of our Android Platform Distribution Updates series. Another month, another update to the Google Developer dashboards. This time there's something new in the Android version stats, although it's a very, very small something. After the unsurprising no-show last month, Android 8.0 Oreo has made its first appearance this time with a grand total of 0.2% device share. Here's a breakdown of this month's changes. Despite the presence of Oreo, Android 7.0 and 7.1 still showed a respectable increase of 2% this month. That puts Nougat as a whole at 17.8%... after a full year. Google didn't update the dashboard last October, but the value for Marshmallow would have been somewhere around 21-22%. Nougat's uptake just hasn't been very impressive. Oreo is a chance for OEMs and Google to be a little more proactive. Nougat popped up last year in November at 0.3%. If Oreo can surpass that mark in next month's stats, we'll be off to a good start. Going forward, support for Treble will hopefully mean faster updates to Android P and later. 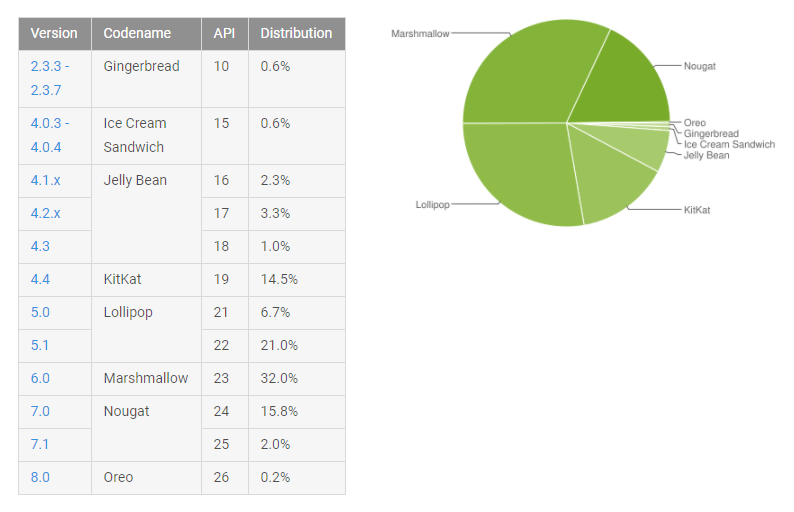 The older versions on the chart haven't moved appreciably this month—both Gingerbread and ICS are flat, and Jelly Bean is only down a few tenths. It'll take a while for these apparently indestructible phones to go away.